This the last post about the DIY Abby Cadabby Birthday Party. You can see my previous posts below to see the other tutorials. I DIY'ed a lot of the items to cut down on costs. I also had a hard time finding Abby Cadabby stuff so I had to make it myself. If you want to learn how I made the other items, click below. I always love making cupcakes at parties because they are so much easier to make and frost. I also like to hand them out right away instead of having to slice a big cake and hand them out onto a plate. You can easily make the cupcake stand above using items you find in the dollar store and at home. It cost me about $6.50 to make. 1/8" of a yard of tulle. You need 4 different round kitchen items to trace to make the round tiers of the stand. I used a small bowl for the top, a regular sized bowl for the second tier, a large dinner plate for the 3rd tier and a large serving platter for the bottom. Take each item, place on foam board and trace around. You want to trace the circles as close as possible so that you have room for all of them on both foam boards. Carefully cut each circle out with an exacto knife. Do the same thing on the poster boards and carefully cut out with scissors. Using double sided tape put little squares of tape all over foam board circles. Take the matching poster board circle and place top of foam board circles. You want the poster boards to cover the white from the foam board. Do the same for each circle. Take ribbon and hot glue around the entire edge of each covered foam board circle. Take each can and measure the height and circumference. Using a ruler draw a rectangle with the measurements you just got and cut out. Using hot glue, glue the poster board rectangles around each can. You want the poster board to cover the can completely. Take the tomato sauce can and put a lot of hot glue on top of it. Glue the smallest circle on top of the can. Make sure you center it well. Let it dry for a few minutes. Put more hot glue on the bottom of the tomato sauce can and glue the next sized circle to the bottom of the sauce can. Let that dry for a few minutes. Take one of the soup cans and place hot glue on top. Glue to the bottom of the second sized circle. Place more glue on the bottom of the soup can and glue the next size circle. Take the last can of soup and place glue on top. Glue to the bottom of the circle you just glued. Place more glue on the bottom of the soup can and glue to the largest circle. Place glue on top of the tuna can and glue to the bottom of the largest circle. Make sure to let the glue completely dry during each step before adding another layer. This way it it will be super sturdy. Take the tulle and cut into about 3" wide strips. Run a 2 inch bead of out glue right under the edge of the largest circle. Using a pencil so you don't burn your fingers add the tulle and pleat as you go along. Keep adding hot glue and pleating the tulle until you have gone around the entire edge of the largest circle. 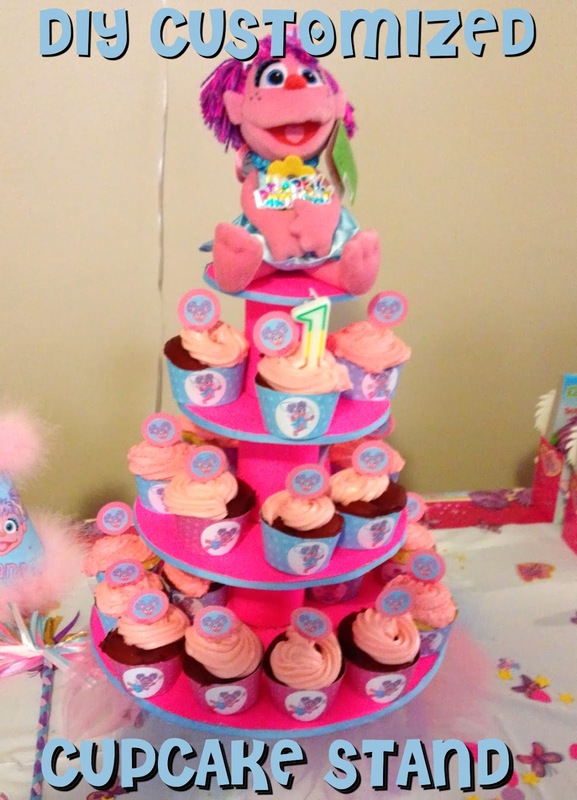 Place doll or decoration on top tier cupcake stand. I would love for you to post a link in the comments section if you make one! That is crazy awesome! And it sounds easy enough to do. I'll have to pin this and save the idea for my twins' birthday in a few months. OKAY I so need that for my upcoming party! Thank you so much, I didn't reallize that was what I needed until I went to your blog page and saw that picture!!!! LOVE IT! How awesome! My little one is turning a year old in April, and I've been looking for a great cake idea. This one is totally do-able, even for the un-crafty like me. Thanks! This is a really great idea, really inexpensive, and doesn't sound to hard to make. Win-Win!!! This is so cute and affordable. Thank you. My son loves Elmo. I need to make one for his next birthday! Thanks for sharing. I am pinning this one to my Party Ideas board. Great idea!!! with 5 kids I am always looking for different birthday stuff! This is so dang cute! I have 4 girls, so Abby is a favorite around here. I'll have to bookmark this for later! My birthday is coming :D Thank you for sharing! I want to make it! This is adorable. I have a baby shower to plan and this would be cute! Great idea to re-purpose cans from the recycling! Recycling is the way to go!! We do it at my daughters gym all the time! I have a grand daughter who lives with me who would love these great party ideas. Thank for sharing! This makes me wish I had a daughter. It is very cute. You are super creative! What a great idea for a little girl! Very cute. That is so cute! I'll bet it just made your daughter smile, along with all her friends! Thanks for the tutorial! Looks like it must have been a fun birthday party! This is so cool! I love cupcakes and this cupcake stand is an amazing, cost effective solution to those expensive cupcake stands they sell at the craft stores. Thanks for sharing this idea! That is seriously one of the best DIY's I have ever seen. Wow! You interested in making me an Anna/Elsa one for my daughter's birthday? LOL! I've always wanted to make a cupcake stand on my own. I can't believe you did that for just $6.50. It looks really nice and colorful! You did a fantastic job! I'm definitely taking what I've learned from your posts and applying it to my son's Thomas the Train party. Thank you! That is clever! I would have never guessed how you made it, and I would have never thought of something like this myself--super creative and thrifty! No, now I'll go away. And eat a carrot! This looks amazing and its super neat! So cool! I gotta save my tomato and tuna cans! This is great idea and it is so cheap! This is super cute and I can't believe it only cost you $6.50 to make! I've got an Abby Cadabby fan too! What an awesome idea, Michelle! That cupcake stand looks great! I love it! So cute! Looks like so much fun and such a great idea! That turned out great! I never would have thought to make a cupcake stand like that. I love the idea of having cupcakes so then no one has to touch the cake but the person eating it. I love the little doll on top. And the idea of a cupcake stand is brilliant for kids' parties. Very cute party centerpiece! I love the doll at the top. I'm going to bookmark this for my daughter's birthday!! I love Sesame Street. You outdid yourself; it really looks great. I would never have guessed how it was made. I love this idea! My sons birthday is this month so I might have to do this!!! Wow, I can't believe you made that! It look amazing!! You are so creative!! This is such an amazing idea! And this way can get the theme you want. Thank you for sharing! Super cute idea! My youngest loves Abby Cadabby!